Casey begins his op-ed by pointing to Planned Parenthood patient Amanda Ream and failing to acknowledge the facts about women’s healthcare in Pennsylvania. Contrary to his statements, Amanda had other options beyond Planned Parenthood as shown by the fact that Widener University has two federally qualified health centers (FQHCs) within five miles of the campus. In fact the two FQHCs, Chespenn Center for Family Health at Eastside and Chespenn Health Services are closer to campus than the local Planned Parenthood.2 Expanding to a ten-mile radius, there are four additional FQHCs that Widener students like Amanda can visit for quality, affordable, and comprehensive care. While healthcare access is important, so is the quality, type, and affordability of the care. The good news is each of those FQHCs provides services beyond Planned Parenthood’s bare minimum to include comprehensive care comprised of services like mammograms and transportation for patients.3 When it comes to the chronic bladder issue that Amanda had, FQHCs are certainly more suited to handle such a concern since Planned Parenthood highlights that its emphasis is on reproductive health. Senator Casey also mentioned the need for affordability, where he neglected to mention that FQHCs provide service regardless of ability to pay. When a patient comes in without insurance, much like someone in Amanda’s position, FQHCs serve them on a sliding fee scale based on their availability to pay.4 Senator Casey failed to acknowledge that women like Amanda have numerous options when it comes to their healthcare, including options that receive federal grants like FQHCs. Beyond his claims relating to the anecdotal story about Amanda, Senator Casey made broad and inaccurate claims about Planned Parenthood in general. He states Planned Parenthood’s involvement in contraception reduces the number of abortions, but their national annual data shows a 13.42% increase in the number of abortions they performed from the 2014-2015 year to the 2015-2016 year (323,999 to 328,348). 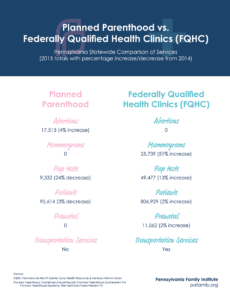 In contrast, their amount of contraception services dropped by 4.62% during the same time-frame (2,945,059 to 2,808,815).5 Senator Casey is making a logical fallacy by equating Planned Parenthood with contraception when in reality it is only one of many providers, private and public, that provide contraceptive services to women from all walks of life. So is access to Planned Parenthood actually vital in Pennsylvania for reproductive care as Senator Casey asserts? The answer is no. 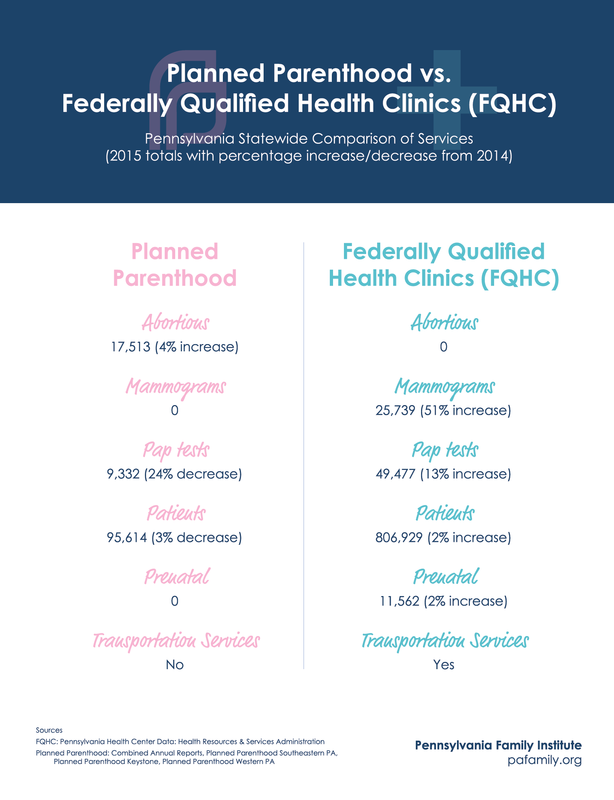 Federally Qualified Health Centers outnumber Planned Parenthood by a significant margin, provide more comprehensive services, and provide services regardless of patients’ ability to pay. If Senator Casey truly wants to increase access to contraception and reduce abortions, he should direct money to organizations, like FQHCs, that are increasing their contraceptive services while not providing abortions. To defund Planned Parenthood is not to defund contraception, but rather change where people receive their contraception from and enable them to receive better, more comprehensive care. The State Senate has an opportunity to provide Better Care and More Access to Pennsylvania women with the passage of SB 300. Please contact your Senator today! Casey, Bob. (2017, June 7). “Why Access to Planned Parenthood is Vital and Must be Protected.” Huffington Post. Frequently Asked Questions. (2016). Pennsylvania Association of Community Health Centers. Michelle-Hanson, Susan. (2017, May 30). “Planned Parenthood’s Newly Released Annual Report Shows Abortions Have Increased- Again.” Live Action. 2015 Health Center Data. (n.d). Health Resources & Services Administration. 2014 Health Center Data. (n.d). Health Resources & Services Administration. Annual Report. (2017). Planned Parenthood of Western Pennsylvania.